The formidable T-55 was the backbone of the Soviet Army, and the militaries of the Warsaw Pact for much of the Cold War. It eventually became the most-produced tank in history! 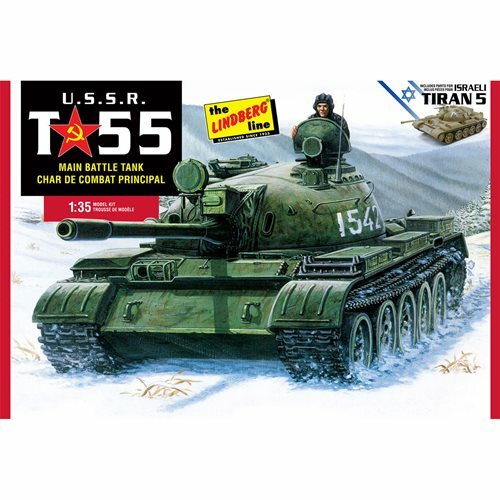 From Lindberg comes this USSR T-55 Main Battle Tank 1:35 Scale Model Kit, which faithfully reproduces the T-55 as used by the Soviet Union. This kit includes molded green parts with black rubber tracks, and optional parts, and decals to represent an Israeli Tiran 5! This kit requires paint, and glue to construct (sold separately).